Hello, 2012. I've been waiting for you. I was sick on New Year's Day - due to a cold and not overdrinking - so I had to skip my semi﻿-annual tradition of having dinner with my mother. We'd planned on making pierogis from scratch, so I was pretty bummed that I didn't get to see her. I did manage to drag myself out of the house long enough to run 1 mile (and complete my 45 day running streak - yay!) and to go to Whole Foods to stock up on a few essentials. And the ingredients for Vegan Hoppin John. Not familiar with Hoppin John? I wasn't either until I Googled it a couple years ago. It's a southern dish that's supposed to bring luck in the coming year. It's made with black eyed peas which are supposed to represent pennies, which we all know, are supposed to bring good luck. 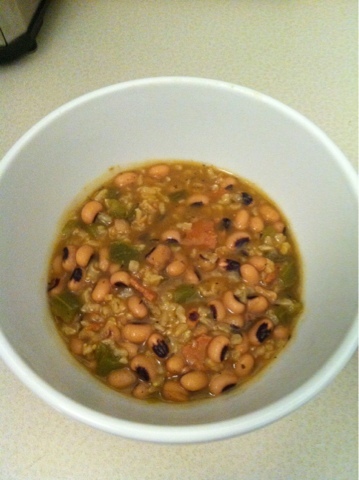 I'd never actually cooked black eyed peas before or eaten Hoppin John, so all I could do was hope that this simple but time consuming recipe would turn out good. Add black-eyed peas to a large pot. Add stock and 2 cups clean water, onions and thyme and bring to a boil. Reduce heat, cover and simmer until black-eyed peas are tender but still whole, about 45 minutes. Add rice, tempeh bacon, cayenne, salt and pepper. Cover and simmer until rice is tender. (this part rook me over an hour) Stir occasionally. When rice begins to soften, add peppers. Season with liquid smoke and Tabasco. This recipe took me much longer to make than I anticipated. I was sniffly and wanted something soup or stew-like and it just seemed to need to cook longer and longer each time I checked on it. I also felt like it was really bland until I added a lot of Tabasco and liquid smoke. Maybe I could have used more fake bacon? Dunno. This was also a really beany dish which normally doesn't bother me, but in this case, I wasn't all that big of a fan. I'll stick to sauerkraut next year! I'm hoping this dish brings me luck in the New Year, though! My boyfriend has already won $70 on the lotto! Do you have any food related traditions for New Year's?